Both types of mercenary contract can be traded on the GTN but the one purchased for credits have a legacy level 40 requirement so double check before you buy! Once the contract is purchase via any of the two methods above, it can be unlocked in your collections for 700 CC for your entire account of characters or you can spend 300k on each character to unlock it as a character perk (i.e. only unlocked on that character the perk is purchased on). Players with legacy level 40 may find it beneficial to spend 1 mil credits to unlock the mercenary contract and then 700 CC to unlock it in the collections unless you have a lot of credits to burn. 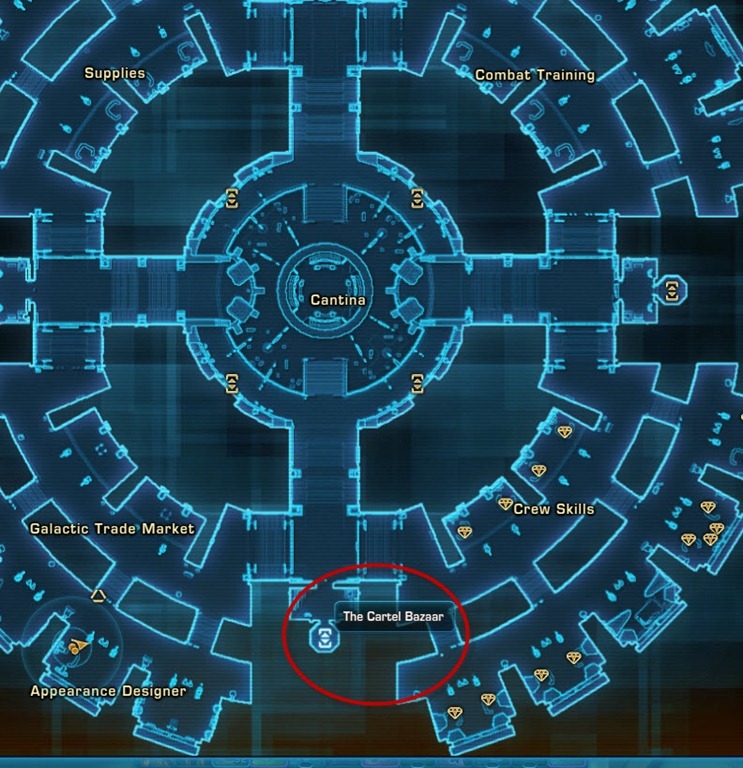 Go to Cartel Bazaar on the south end of the fleet (north end for Republic) once Patch 2.3 arrives on live servers. 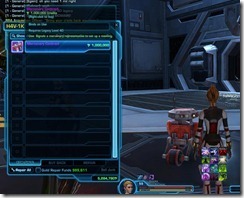 You will see a droid that sells you a mercenary contract for 1 mil credits (requires legacy level 40) and using it will bring up a short conversation where you are introduced to Treek. She is a heavy armor user with Aim as her primary stat. She has both heal and tank stance. 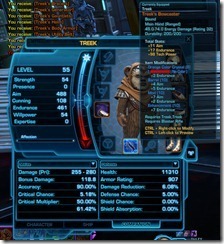 Treek uses either Blaster Pistol/Blaster Rifle in her mainhand slot and a generator/shield in her offhand slot. 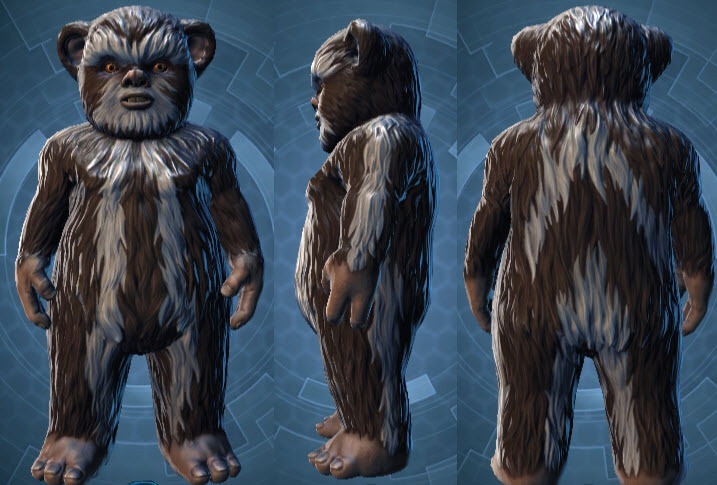 Fektur Stance Treek enters a healing stance, increasing all healing done by 5% and lowering threat generation by 25%. Additionally lowers the cooldown of all healing abilities. Daboolhat functions differently in each stance. X’erka stance: Treek glides to an enemy target within 10-30 meters, immobilizing it for 2 seconds and walloping it for x kinetic damage. Fektur stance: Treek sends a fektur bug at an enemy target. The fektur bug lands on the target and evaluate it for up to 8 seconds. If the target attacks a party member, the fektur bug flies to that party memnber and heals them for x amount. Klektuhkuh Thleek Treek hurls a spear at an enemy target dealing x weapon damage and causing the target to bleed for x damage over 15 secodns. 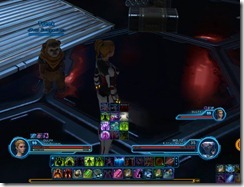 If Treek is in X’ekra Stance, this attack generates additional threat. Siz Whistle Treek blows a whistling flame at an enemy target, dealing x elemental damage and increasing Treek’s armoring rating by 20% for 15 seconds. If Treek is in X’erka Stance, this attack generates additional threat. Boom Thuk Treek hurls a cluster bomb above an enemy target, where it explodes and deals x kinetic damage to all enemy targets within 8 meters. Does not hit sleeping, lifted or incapacitated enemies. If Treek is in X’ekra Stance, this attack also generate additional threat and reduces the damage dealt by enemy targets by 5% for 8 seconds. Fektur Sleesh Treek tosses a medicinal berry at the ground near a friendly target, healing all group members within 8 meters of the friendly target for x amount. Requires Fektur stance. Fektur Dart Treek injects a friendly group member with medicine that heals for x amount over 12 seconds and cleanses one negative mental or physical effect with each tick. Fektur Sling Treek heals a target group member for x amount over the channel duration and an additional x amount at end of the channel. Treek may not heal herself with this ability. Tana Teeket functions differently in each stance and requires Treek to be at or below 70% HP. X’ekra Stance: Treek shatters a beehive near an enemy target, unleashing a bee swarm that stuns all enemies within 8 meters of the target for 4 seconds. Fektur Stance: Treek drops a smoke bomb, which significantly reduces her threat and causes enemies to ignore her for the next 4 seconds. Bounty Hunting Treek Customization – 250k credits, requires Friend standing with Bounty Brokers Association, Bind on Legacy. Measured against rank 2 green companion gifts on Treek with 0/10000 affection. Wow, this is surprising. I thought Ewoks were not discovered for another three thousand years. From what I read on the forums, that’s explained in his dialogue. Lore? Give me a break. Star Wars lore has never been consistent and barely rises above the level of fanfic. Heaven forbid a Star Wars game adopt elements from the Star Wars movies. If it’s fan service, who cares? 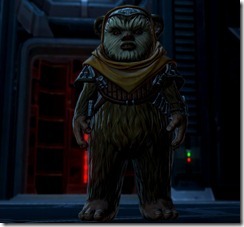 The HK companion appeals to one end of a spectrum of Star Wars fans; an Ewok companion appeals to its opposite side. In both cases I heartily approve. Well Basically can be like the voss. They were discovered before swtor time and forgotten all about completely. Same can be true for ewoks. Don’t forget that C-3PO already knew the Ewok language. That had to be added into his database from somewhere. No, the ewoks spoke a dialect of a language 3PO knew. Yes, but how would that even be possible if nobody had ever encountered them? It’s pretty far-fetched to assume that if we someday discover life on other planets, they’ll speak a dialect of English. It’s done in shows like Stargate SG-1 sure, but that’s because you can’t have them having to learn a new language every single episode like they did in the original movie… so it requires a certain suspension of belief. But, it’s not necessary here, so again… If the Ewoks speak a dialect of a language C-3P0 knows, somebody somewhere had to either learn the Ewok language or teach them the language they use in order to program C-3P0 with it. They aren’t. This is someone at Bioware messing with the lore. Actually the republic has a secret research base on the Forest moon of Endor at this time according to lore. So its not like they are completely unknown. But i still dont like this. TIL that. Good to know. Dulfy, does this companion really come starting with level 10 mods in his gear? For a million credits I’d expect better. one correction, one of his stances is a tank mode. So I think he’s heals/tank. DO you know yet, or can we assume there will be a cartel coin option? To buy him with either Cartel Coins OR credits? that is what I want to know. I am kinda hoping it is only credits so people with a high legacy now actually have something that is “exclusive” to them again. Well, it could be legacy required… I just think having it require 1,000,000 credits as the ONLY option now that they have the Cartel Market is kinda lame… I’d be fine with it having the Legacy Requirement. Cause it would be a LOT easier to buy him for all my alts paying 600 coins or whatever than to have to get up 13,000,000 credits (currently have 13 character, plan to have 16 total… one of each advanced class and light/dark story)… there’s one helluva lot of other stuff I’d rather use actual credits for. AH JUST READ Dulfy’s update there WILL be a cartel coins option. Hopefully though they still keep the Legacy requirement. I think that’s cool for this to be a special reward for high level legacy people. I think I’m around 35 right now? Don’t remember. I don’t mind that he uses aim like all the rest of my companions, since I’m a Trooper! Good stuff. 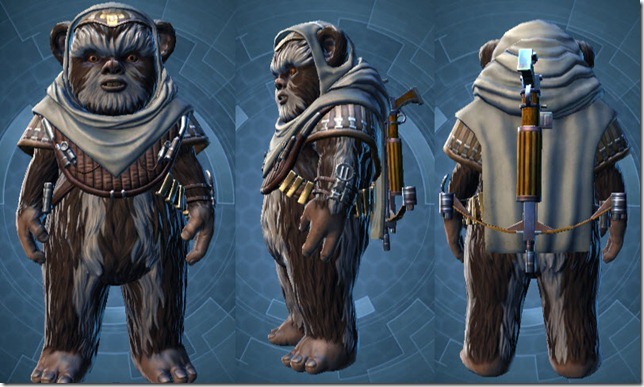 already Jawa in game, now Ewok, so it’s going to be Gungan next? I the Gungan is female and ANYTHING like that fem!Gungan in The Clone Wars with her pole…HELL YEAH!! So 1 million for additional characters and no option for purchase with cc? Not that I have seen, they may add it in on live. Once one character on a Legacy has completed the quest and received the Treek Legacy Unlock, any other character on that legacy can purchase the Treek Character Perk for the appropriate faction, which will instantly grant that character Treek as a Companion without needing to complete the quest again. The Character Perk is purchased with in-game credits (300,000) and requires Legacy Level 40 and Character Level 10. Can you romance this companion? hey dulfy, thanks for your website! There’s a rogue “his” in the “She is a heavy armor user with Aim as his primary stat.” sentence which you missed when correcting Treek’s gender. Would that mean that they would increase amount of companions sent on mission by 1? Or keep it at 5 as default? Bye bye Theran you prick. Pacifist my $&£! Kaliyo is no dumb Wookie or Jawa. Only Companion I want to kill is Malavai Quinn. No, Kaliyo is a dumb Rattataki. In Beta, you used to be able to kill some Companions, but Bioware decided the shitstorm from players who “accidentally” did so wasn’t worth it. 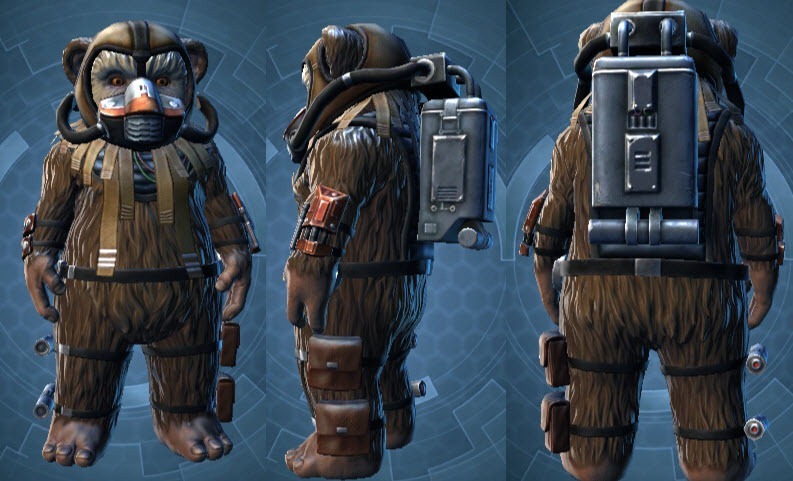 Any news on whether there are later companion quests on reaching certainly levels of affection with Treek? Does she still use her healing abilities while in the tank stance and visa versa? Based on dulfys notes the following should work in tankstance:Fektur DartTreek injects a friendly group member with medicine that heals for x amount over 12 seconds and cleanses one negative mental or physical effect with each tick.Fektur SlingTreek heals a target group member for x amount over the channel duration and an additional x amount at end of the channel. Treek may not heal herself with this ability. Wow so glad I have already walked away from this game. If they are already at this level it is sad. Possibly the best companion ever, Needs a male version as well…. I wonder how Treek and Blizz will get along…. Hmmm..
Or Treek & Bowdaar, though I guess that was more Chewie living on Endor than anything else. Probably nothing then, unless Treek, Bowdaar, & Broonmark have some sort of… *shudder* furry relation. Wonder if Treek comments on PC with the Cathar race? so what is next, maybe a pet yoda? You must buy for every character you have or you can unlock it via legacy after 1 bought? Buying HK on an alt is a disappointing joke. He comes in his level 50 gear and can’t use it so you have to pay and then fully gear him from the ground up while his full level 50 loadout devours your bank space. Why does Treek’s voice sound so familar? I need to have Rise of the Hutt Cartel or be a subscriber if i want to have Treek? Don’t think so, at least not now on the pts. This may change when Treek goes live. True, I am building my escrow to several million right now so I can sub for a month, buy a bunch of stuff and drop sub again. First, love your site! Was wondering if they have or do they plan to raise the amount of deployable companions on crew skill missions? I don’t see how one Ewok going the other way and escaping off a moon which according to Lore has always had lots of visitors messes with anything at all. I grok that there is large segment of Star Wars fandom that hates the kiddie part of the canon, but, like it or not, Ewoks and Jar Jar and all the muppets are part of the story. I know many fans who love Ewoks, but if they’re not your cup of tea, save your credits for something else and keeping hanging out with HK or Skadge or Zenith or whatever badass floats your boat. 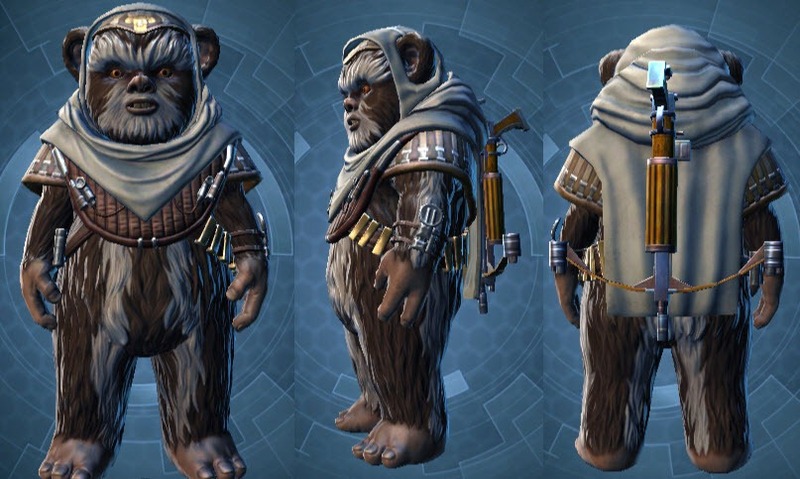 Personally, I think BW has done good job with this aspect of Star Wars: Ortolans on Hoth, T7 and the always awesome Blizz, so I will happily take the Treek ride. Actually they did “exist” in this time period. They were just confined to their moon/planet and lived in a stoneage level of technology. That planet was, however, host to a secret republic bio-lab at this time so it certainly wasnt completely unknown. And Treek is the only one that happened to leave the planet during this time period. Now, i dont like the thought of an Ewok companion either. But there is no lore reason for it to not exist. Nothing lore wise has ever come up saying any mention of Ewoks before the Galactic Empire so if no mention then lore wise and in a none technological way of getting off planet then at what point did they exist? Actually, Endor existed and was noted in this time frame. 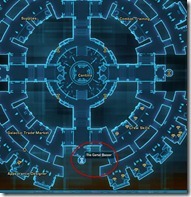 The Novel Red Harvest, released before SWTOR was released, indicates that Endor had been discovered and mucked with two years before the SWTOR timeline. Sources below. You can put covert gear on him if you wish. But i’d say he’s probably similiar to Bowdar. If I recall correctly, That’s how it works for Bowdar. I believe Blizz is the same. Except for the customization kits and weapons, no matter what you equip to Bowdar or Blizz, their appearances do not change. I think anyway. It’s been a while since I played either of those classes. Khem Val, M1-4X, Qyzen’s (Feet only), Blizz, Broonmark, Scorpio, Lokin (Rakghoul form), T7-01, Bowdaar, All Ship droids, HK-51, and…. Treek. Oh, and Skadge….I mean he’ll be ugly no matter what you put on him. Just like all the other companions that are non-human (or non-near-human) her looks wont change because of her armour. Her weapon will change, however, if you give her another. Companions are pointless and frankly stupid for end game content. They are nearly impossible to gain affection with since pretty much nothing you do in the game get’s you affection after you are max lvl. None of my HK’s are even half way maxed affection. Not only that, there is no way in heck I am spending 1 million credits on it. WAY to steep for me. It takes me quite awhile and work to get one toon to have 1 mil. Too much for me. And, is this the “subscriber bonus” they spoke about for July? Because if it is…its CRAP. Yeah, they are no help at all with dailies at 55 :p. Don’t even get me started on how useless a freaking tank that can heal, hot, and cleanse negative status effects would be if someone were to get them on a leveling alt rather than a 55. What a joke right? I haven’t played TOR in a little over a year, but did they scrap Treasure Hunting and Archaeology as professions? Because that was the #1 way that I made all of my companions love and/or snog me. No, they didnt removed it. Grade 5 companion gifts through treasurehunting are still the way to go. HK however doesnt seem to have a love thing (the tier 3 affection), only up to tier 2. Can you update your article ? Thanks and keep up the good job ! Producer Cory Butler has confirmed that there will be a Cartel Coins option for those who are short on credits and the prices here on the PTS do not reflect the prices on live servers. Dude Vahs,is it you from tomb of freedon nadd? 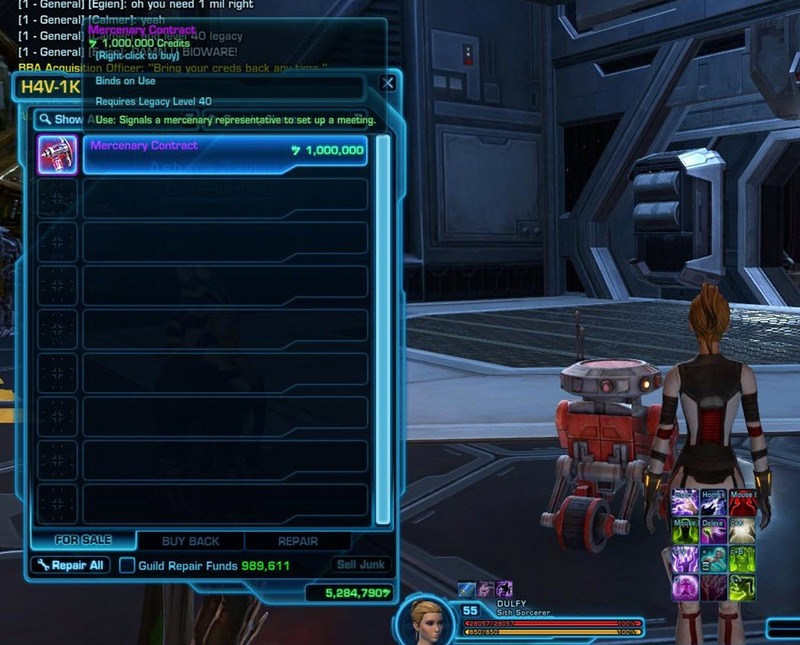 There was a guy named Vahhs or it was Vahss that made a guild with me on republic side!!! Do you know how many coins will treek be in cartel market? I need the info so I know how much coins I can spend. Couldn’t you just go catch one? They’re wee and harmless, right? Dulfy, did they remove the lvl up console from PVE supplies area? There will be a cartel coin option if you can’t afford credits. Tried giving Treek some blue rank 5 gifts, and she was really into the technology one as Dulfys info would also indicate. However, what surprised me was, that she was giving way more affection than say HK-51, who seemed a little gated that way. With all the perks for companion gifts (30%) an Aratech Reconstruction Toolkit gave me 312 affection at appx. 0/10000 affection. HK doesn’t love anything. Or the way Dulfy put it, nothing gives higher than Moderate affection for him. So with the addition of another companion(8 total if you count HK, your Ship Droid and now Treek), will we now be able to send out more companions on crew skill missions?? Cause I’m already capped at 7, but can only send out 5…..which doesn’t really make sense. Hey DuIfy, if you buy treek with cartel coins, do you need your legacy to be at 40? Nope, legacy requirement is only for those who buy it w/ credits. 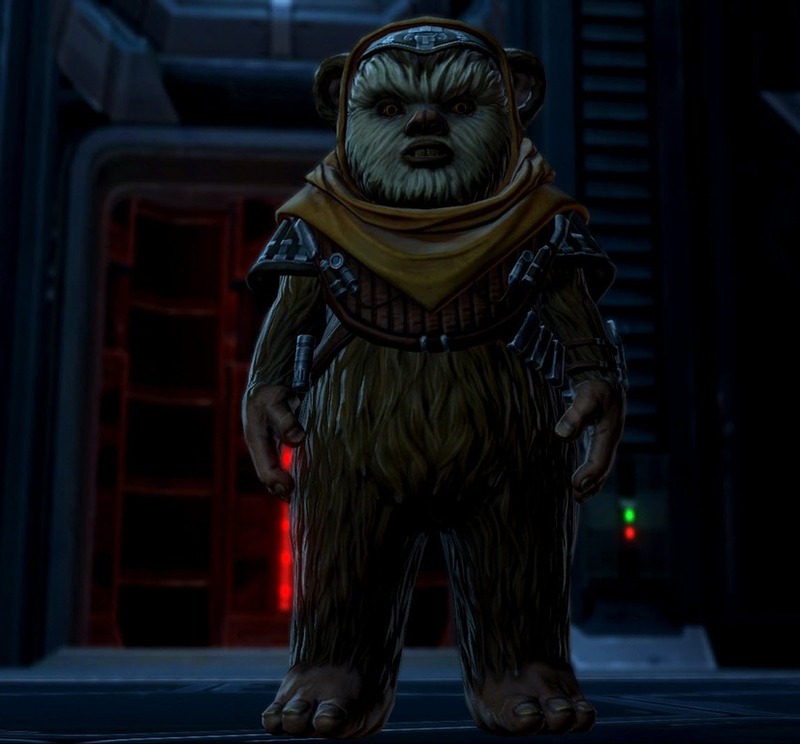 Does anyone know how many Cartel Coins it will be to obtain Treek? Can you say what if any impact it would have using a pistol on her as opposed to a rifle? Don’t think it has any. is the “quest” you get only lots of dialog or do you need to do stuff as well? Treek means Go in Ewokese. 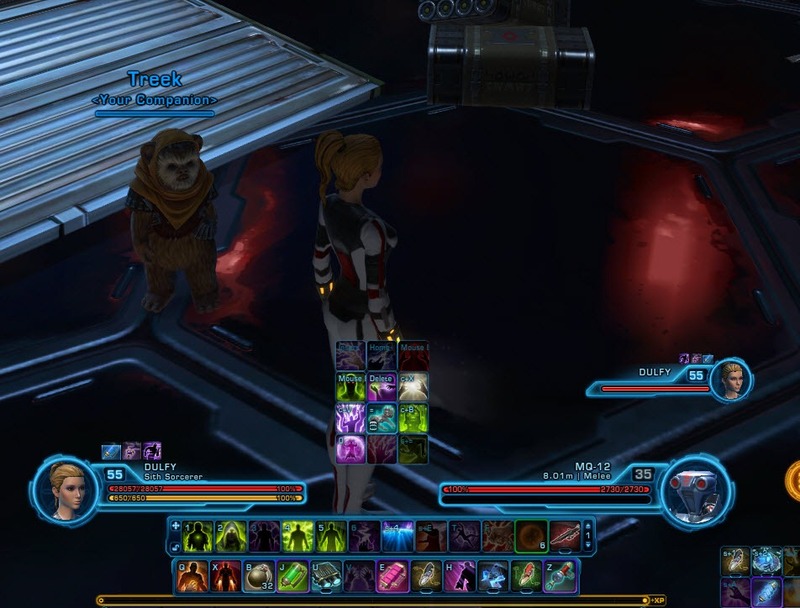 Is it possible to unlock other talks with Treek after increasing her affection (like with other companions)? Or is it just 1 talk when she tells her background story? Yes she will have differ convos for reaching different affection thresholds like other companies. I just pushed Treek to 10k, and no new conversations. I’ve run into this issue as well. After the first conversation, I showered her in gifts. She’s asking to speak on the ship, but there is no quest icon. 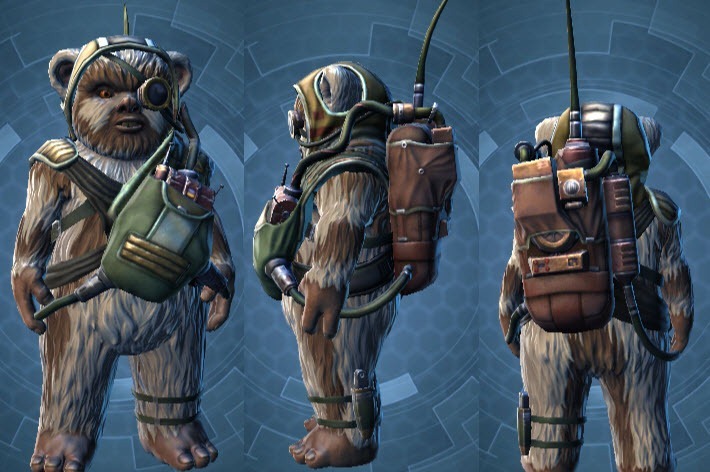 Treek Customization 1 (no clothes), 2 (green bandolier), and 3 (face mask). Where is the 700cc unlock for all characters? Only unlock I have been able to find is the 300k credit unlock per character in the Character Perks area. The Character Perk item doesn’t offer a cartel coin alternative purchase option. Under Global Unlocks / Other / Companions you have a Treek item but that seems to just indicate that Treek can now be purchased by your other characters via the Character Perks 300k credit item. Look in Collections for the Mercenary Contract. Ya also cant find this 700cc unlock for this character under collections or perks or on the Cartel Market? disregard…I reloaded the game and it was added to my collection. aim, crit and alacrity are great for healers. If Treek can be bought at level 10 with CC, can he be used to help level a toon and if so what happens with his gear stats do they scale or is he a lvl 55 character that would be very handy to speed level? 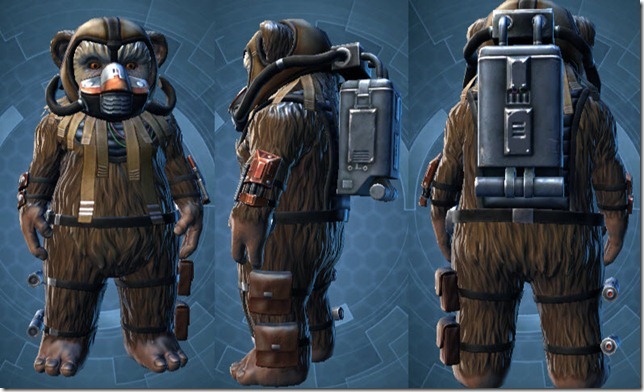 Treek comes with lvl9 gear, no matter what level you are. NO, what is painfully annoying is her constant jabbering…I literally didn’t know I had a pimp hand until Treek. I would PAY CCs to have her stfu! She holds aggro like a woman walking by a dock worker in a bikini though, so I suffer thru it in dailies. what is the easiest way to gear him since he comes with level 10 gear? Probably using the basic comms you can get from doing dallies. Also buy mods from the equipment modification vendor in Makeb/fleet section. Has the 700cc unlock of all characters been removed? I am no longer finding it in the locations noted earlier. Its still working but the directions are a bit misleading. I did it today 2/11/2014. Go the the cartel market and then click on collections. Then instead of going to Toys nav item its under the very first nav which is Cartel Market under the “special” secondary nav. 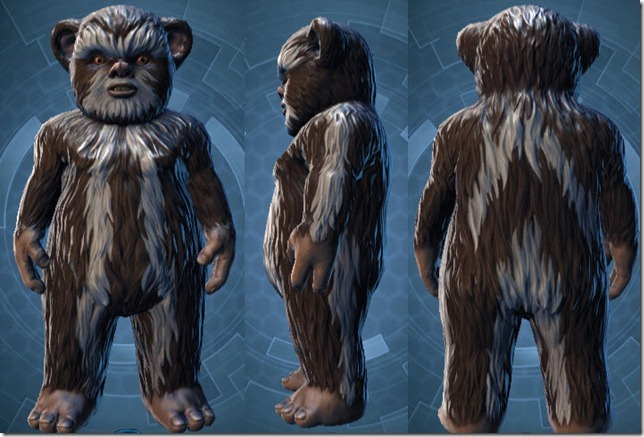 There you will see Treek and you can click on him and unlock him for all accounts for 700CC. Then you have to click on it again to actually claim him and put him in your inventory. Then you click on the item in the inventory and get the quest short chat quest to get him. This was a frustrating 30 min to figure out; hope I saved some people that aggravation. The location helped. If, like in my case, you first purchase the Treek contract for 1 mil and get Treek, you then go to another one of your characters to get the option to buy for all characters for 700 CC. I couldn’t do it with the one I made the first purchase from. What enhancements are best for the healer version? Would endurance/power/surge be best or something else? That works or crit/alacrity stuff. 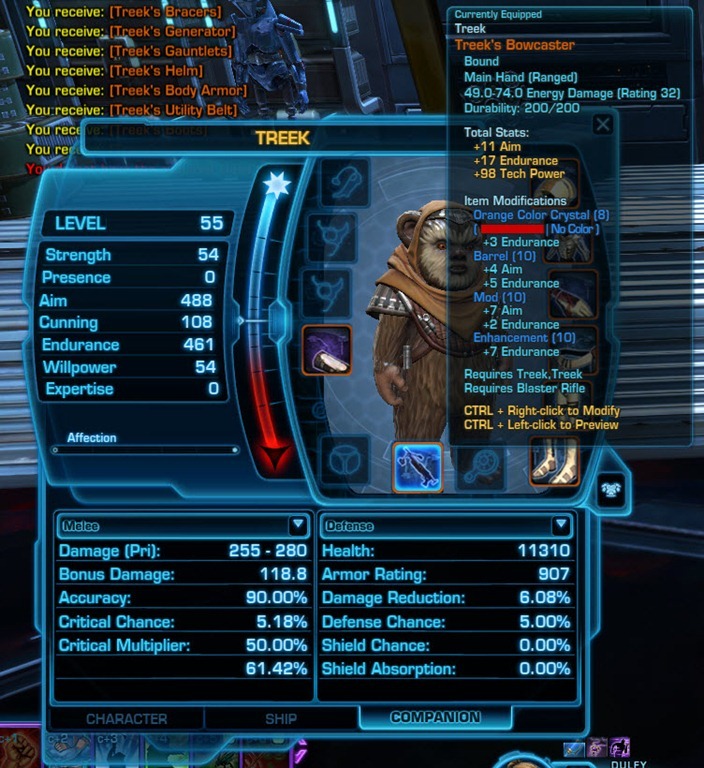 im a sorc heals and wondering if treek is worth gearing / using as a tank. i usually use ashara for questing and xalek doesnt seem to be cutting it. so do i gear her like a BH powertech. She is widely considered the best tank in the game and does a lot of damage. I am not familiar with the Sorcs companions aside from the first one, she’s definitely better than him. As of now, whatever Treek once was is now a moot point – she can now be anything, like all the other companions. However, I could not unlock Treek accountwide for 700CC anymore as it is stated above. I think that was changed at some point – now unlocking her for 300K ist the only available option and it’s not accountwide.